The plague, aka the nasty cold with a sore throat and a cough that has been going around, hit our house hard this week. While I am desperately trying to fend it off, Thing 2 and my husband have succumbed, and Thing 1 is starting to show symptoms. It’s also been ridiculously (if seasonally) cold the last few days, averaging about -35°C (-31°F) at night with the wind chill. All of this together means that the best thing for everyone to eat is a nice, hearty soup. 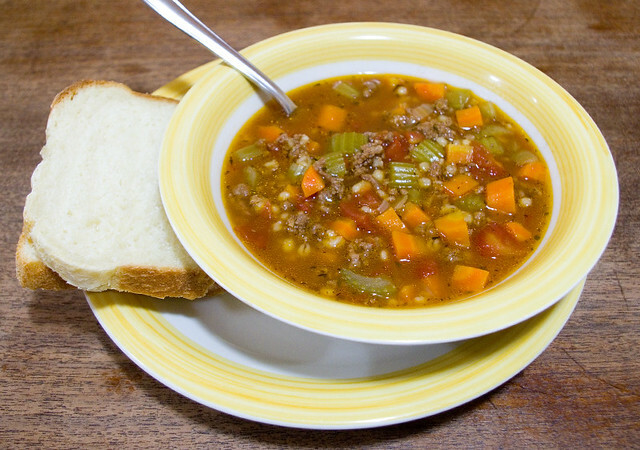 So last night I made Hearty Hamburger Soup in my Instant Pot. It’s actually a stove top recipe, but it’s easy enough to adapt; I just did all the sautéing in the cooker, drained off the fat, added the rest of the ingredients and then pressure cooked for 30min. This is a dish that I’ve been meaning to make for years, and the ingredients are generally the kind of thing I have stocked in my pantry and freezer. I’m told that my aunt makes a killer version of this dish, but I haven’t been able to wheedle her recipe away from her. The Allrecipes version was quite nice, though. I made the accompanying bread earlier that day in the bread machine; it was Egg-Enriched White Loaf on page 67 of Bread Machine: How to Prepare and Bake the Perfect Loaf by Jennie Shapter (2002). Thing 1 is learning how to cook, by which I don’t mean just helping me in the kitchen, but actually planning and preparing entire meals. She’s been able to successfully manage pre-packaged food for a while now, so she wanted to step up her game. I gave her free run of my cookbooks last week, but I suggested that for now she stick with some of the ones meant for beginners that I’d picked up over the years. She really likes Essential Cooking Basics: The New Cook by Mary Berry & Marlena Spieler (1997), I think at least in part because it’s full of detailed step-by-step photos, but isn’t only targeted at children. She prepared this dish almost entirely by herself, although I remained nearby to field (many, many) questions and to introduce her to some new techniques. She chose to make Stir-Fried Ginger Chicken (page 88), which is the kind of meal that takes a lot more time to peel and chop than to actually cook. 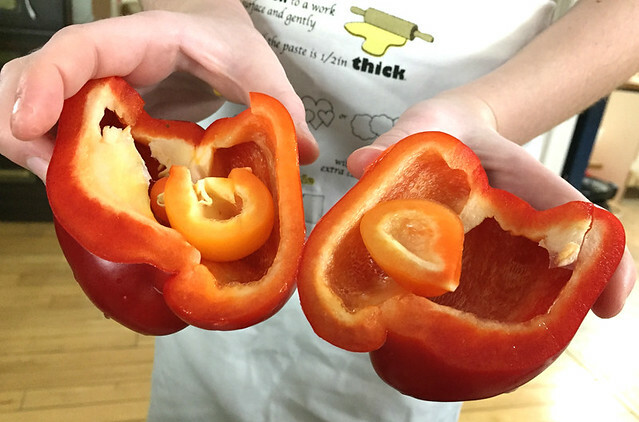 She was only just starting to prepare when she cut open a sweet pepper to find another tiny pepper growing inside! 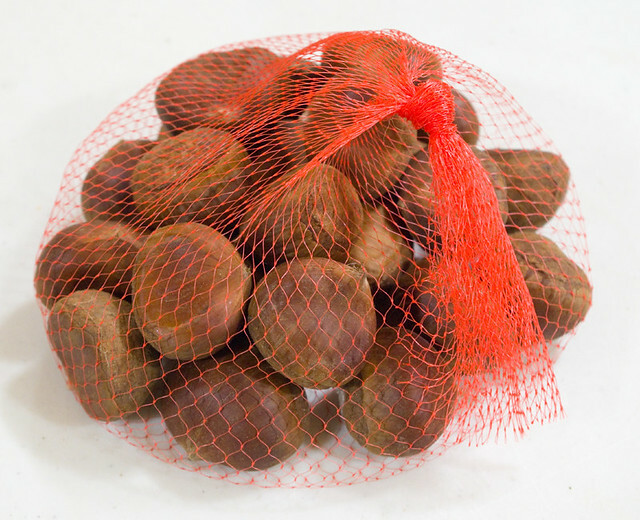 I’d read about this phenomenon before, but hadn’t chanced upon it myself; it’s called parthenocarpy, which is a kind of internal proliferation of a fruit without fertilization. 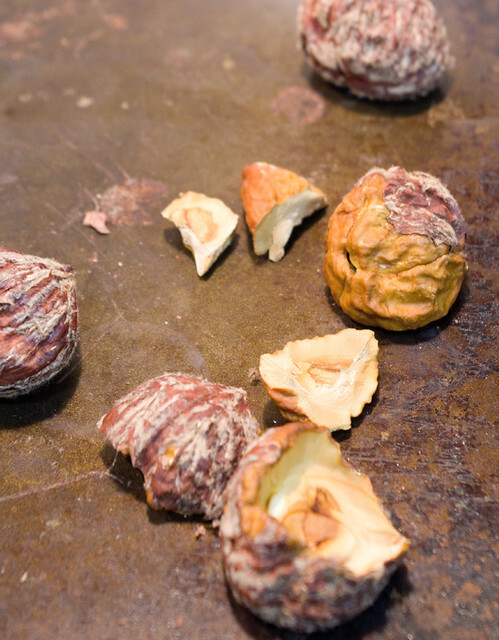 Basically, it’s a tiny natural clone of the larger pepper — and it’s perfectly edible. Yes, I know the knife in the background shouldn’t have been left blade-up; Thing 1 put it in the dishwasher moments after this photo was taken. 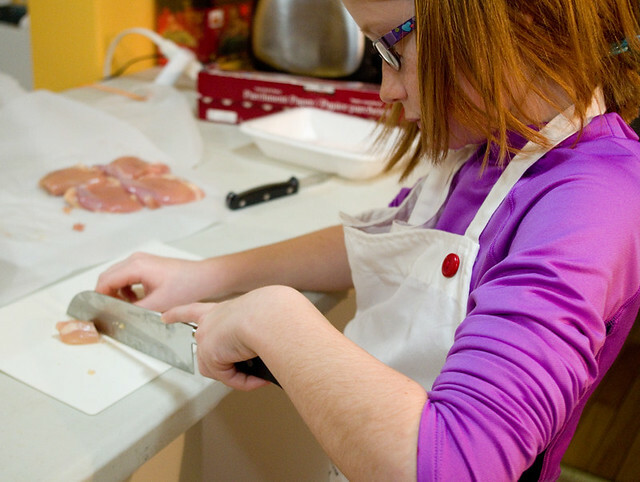 Knife skills are, I think, one of the most essential parts of learning to cook efficiently. I’m no speed demon myself, but I’m reasonably quick I manage not to cut myself most of the time. I find that even a lot of adults are awkward and slow with a knife in the kitchen, so I hope that starting Thing 1 early acquiring this skill will mean it’s easier for her as she grows up. 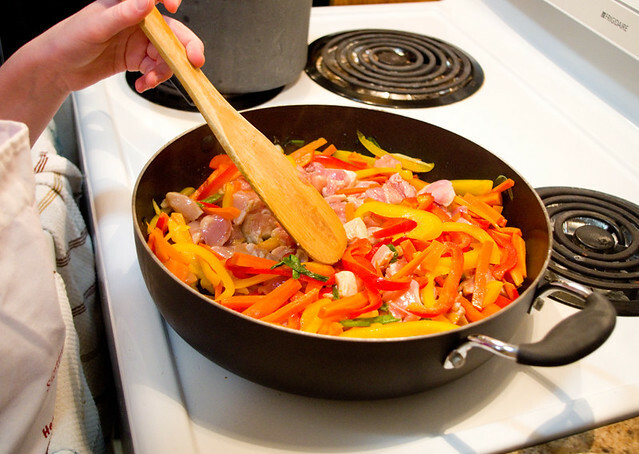 Another part of learning how to cook is learning how to adapt a recipe to what you have. I, for example, don’t have a good wok any more, so the dish had to be cooked in a large non-stick frying pan, which meant that the instructions had to change a little bit. Also, I couldn’t find the specific kind of noodle that the recipe called for, so a few adaptations had to be made for that. 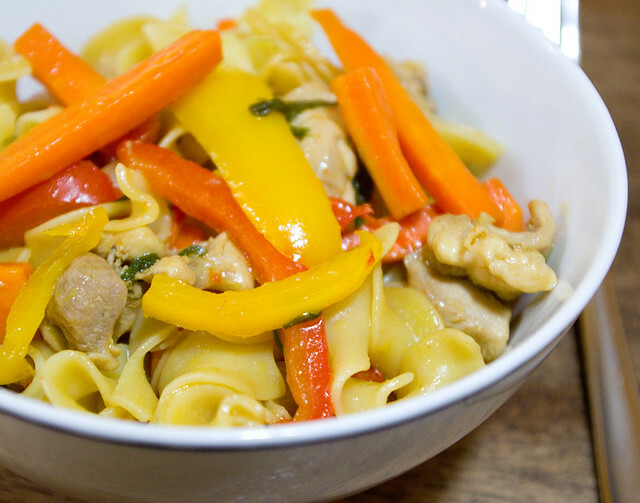 Thing 1’s final dish was perfectly prepared: the veggies were still a little crunchy, the chicken was moist, and the noodles were al dente. Everyone went back for seconds, and there was still enough for Thing 1 to take as leftovers for lunch the next day — and show off to her friends. When I was a kid, my mother liked to tell me the story of how she and my father met some of their friends back in the day. You see, Mom and Dad didn’t go to university directly after finishing high school; Dad earned a college diploma first, and Mom worked for a while. This meant that they were a few years older (and hopefully more mature) than most of their classmates. Not only that, but they had gotten married before they started university as well, which was (and I think still is) extremely unusual. This combination of factors meant that they didn’t really fit in with a lot of their peers. However, there was an extremely small community of international students attending the university at the time, and a lot of them were also older, and few were even married couples. My parents naturally fell in with this group of students and they became great friends. This meant that my parents (who are both white and from not only small towns, but military small towns) learned a lot about a number of international cultures and foods when otherwise they probably wouldn’t have done so. A number of their friends were from Lebanon, and one of them (or possible a few of them, I may be misremembering) wanted to help publish a Lebanese cookbook to be sold in Canada. 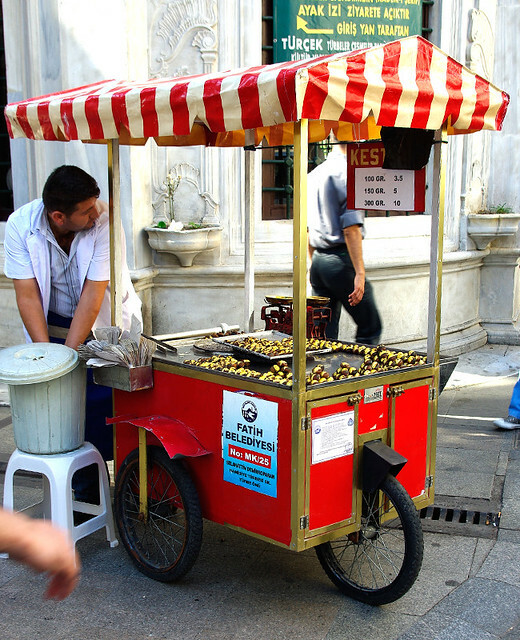 It was to include a lot of dishes that were common knowledge in Lebanon, but were considered “unusual” and “exotic” at the time throughout most of Canada. My parents got to be the testers for a lot of these dishes, since the authors were trying to tailor the recipes to a wider audience. Always enthusiastic about trying new foods, my parents were very happy guinea pigs. 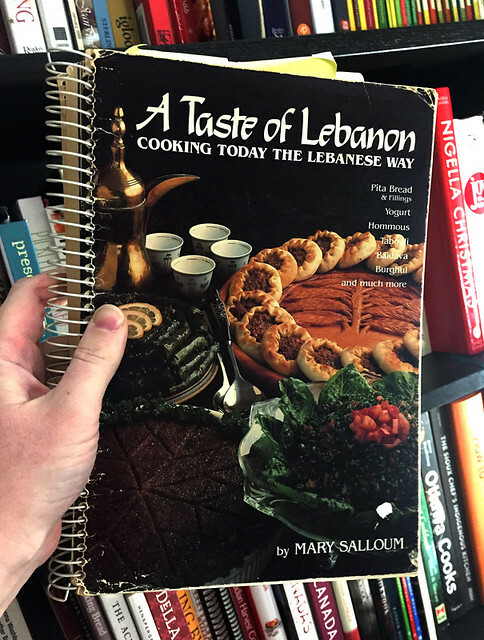 Now, I think that A Taste of Lebanon: Cooking Today the Lebanese Way (Mary Salloum, 1983) is the book that this eventually became. My father bought my mother a copy for Christmas the year it first came out. My parents used that book regularly until it was passed down to me a few years ago when I started to show a greater interest in cooking. 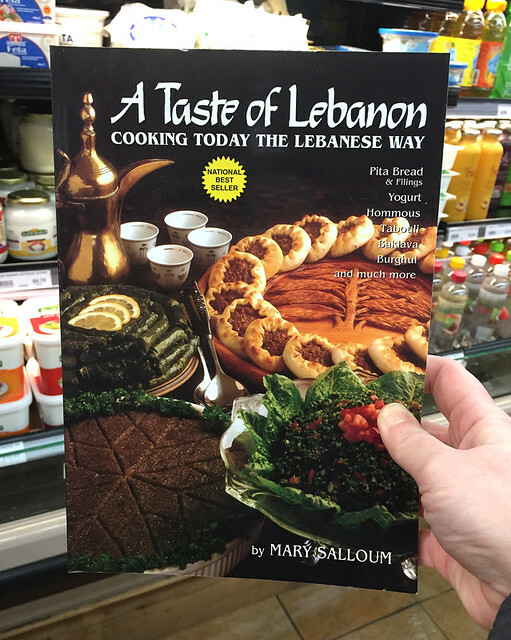 Imagine my surprise, then, to stumble upon a brand new copy of this book at the Mid-East Food Centre; I didn’t realize that it was still in print! Not bad, considering it’s been more than 35 years. A quick search online revealed that it’s also available online as well. I would definitely highly recommend getting a copy of this book if you’re interested in Lebanese cooking even a little bit. As a bonus, it is a Canadian publication, so it focuses on ingredients that are actually available here. Finding this book still for sale prompted me to go back to my own copy and make one of the easiest of the recipes therein: hommous bi tahini, i.e. chick pea dip with sesame seed paste. You can buy a large variety of types of hummus in just about every chain grocery store these days, since it’s considered healthy and trendy now. But when I was a kid my parents had to make it for us. Actually, since it’s a no-cook recipe (all you need is a blender), it makes a lot of sense to make your own hummus if you can. I based the prices here on the everyday listings found on the Superstore website; you could probably find a lot of these ingredients even cheaper if you shop the sales. Now compare that to the pre-made prices, which start at $3.47 for a comparable amount, and go up to about $5.00 for the fancier stuff. That’s a pretty big saving if you make it yourself, and it’ll add up if you’re the kind of person who eats it regularly! 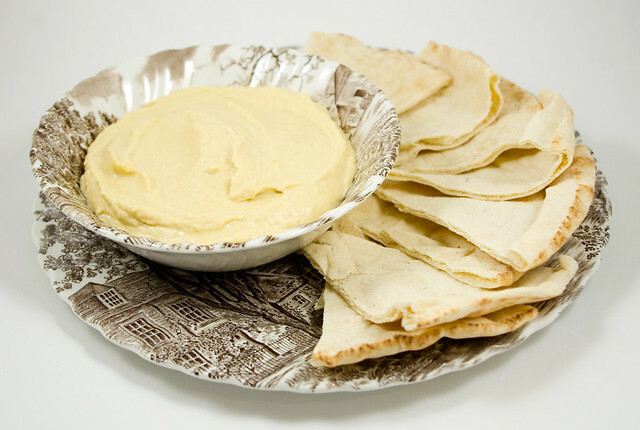 Now, my favourite way to eat hummus is on fresh pita bread — and one of the next recipes on my list is pita bread itself, which is also in this cookbook. But I know a lot of health-conscious people prefer it as a veggie dip, as it’s great with sliced sweet peppers, carrots, or celery. 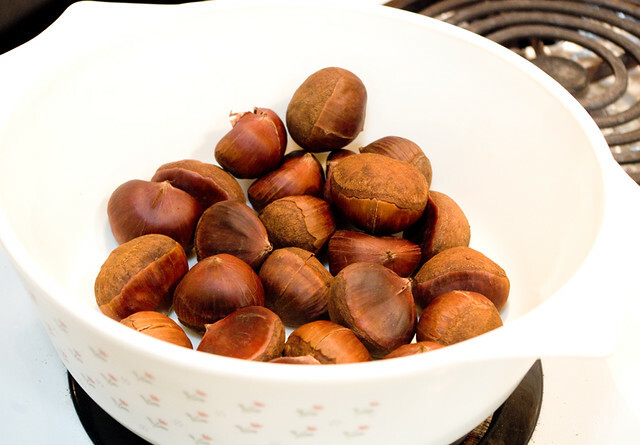 (Of course, it’s vegetarian, vegan, and gluten-free too — not that these dietary trends were even on the radar of this classic food.) A Taste of Lebanon recommends that hummus and pita be served with any fish recipe, baked kibbi, tabouli, barbequed chicken, or shish kabob. It is truly one of the most versatile dishes I have ever made. One thing we share as a family is that every single one of us loves sushi. However, we do differ as to which one is our favourite — the best bribe ever to use on Thing 1 is salmon nigiri, while Thing 2 is a big fan of a California roll or any maki with shrimp tempura in it, my husband prefers hand rolls (temaki), while I actually like sashimi (just the fish/seafood), possibly with a bowl of rice on the side to fill me up. That being said, I don’t know why it didn’t occur to me before now to make sushi at home. I used to do it all the time in high school and as a young adult; I actually hosted a few dinner parties where we all rolled our own sushi. 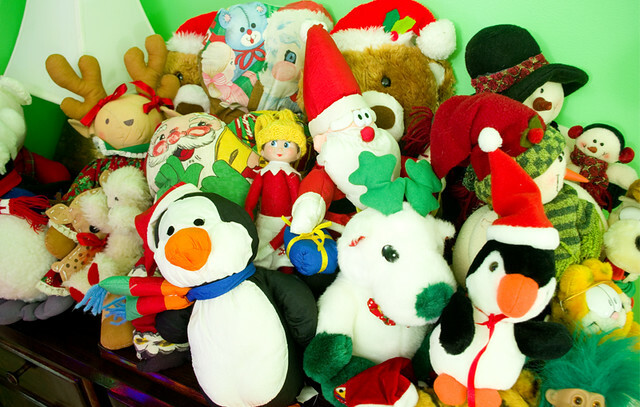 However, it is very time consuming for one person to make a family’s worth, and I guess I just set it aside until I thought the kids were old enough to help me out. But the kids are both old enough now to assemble their own soft tacos or burritos, and sushi uses many of roughly the same techniques, so I thought it was time to give it a go. 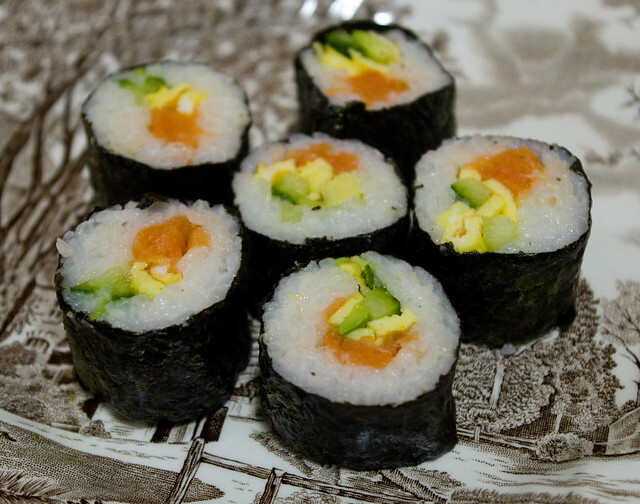 Last night I made up a big pot of sushi rice and cut up all kinds of toppings: smoked salmon, cooked shrimp, scrambled egg with a bit of mirin mixed in, cucumber, carrots, and avocado. 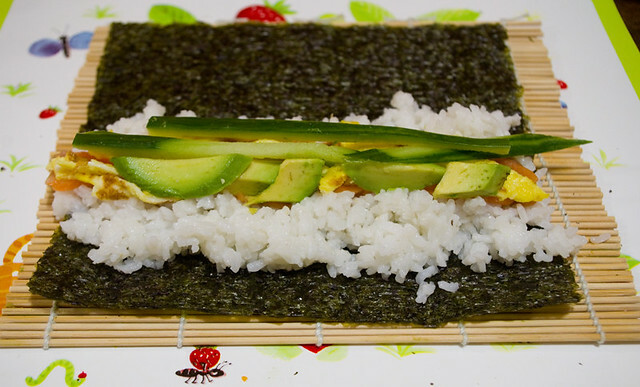 Then I dug out one rolling mat per person and let everyone assemble their own sushi. 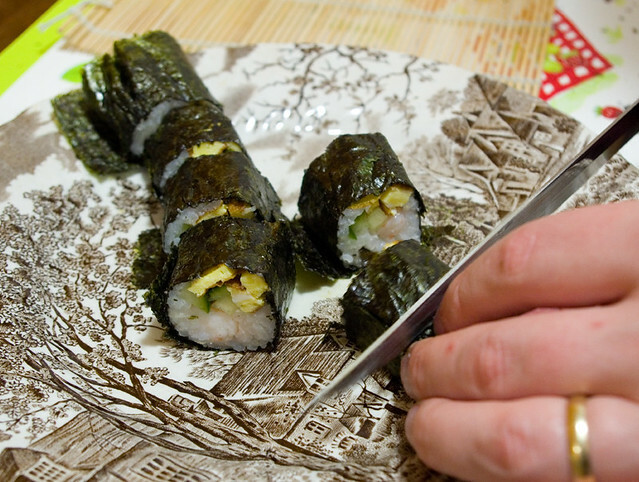 The nice thing about making sushi this way is that everyone can have it just how they like it, although probably not as pretty as they’d like it, that comes with a heck of a lot of practice. I find it surprising that a lot of people around here still assume that sushi automatically equals raw fish, when it’s really all about the vinegared rice. You can top it or roll it with just about anything you’d like. You can even avoid fish or even all animal products altogether, although the purists may take objection to that. 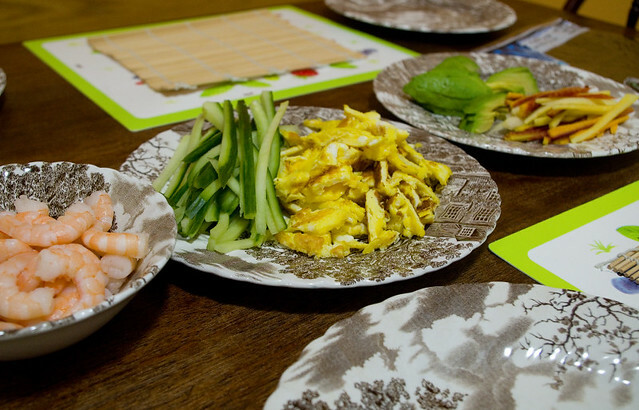 But let’s be honest, purists aren’t going to be rolling sushi at home with their six-year-old, they’re going to be paying a very skilled professional chef to create the perfect mouthfuls. I really liked the combination of the saltiness of the smoked salmon with the sweet egg and the crunch of cucumber. The egg-and-shrimp roll I made could have used a little more punch; perhaps I should pick up some spicy Japanese mayo for next time? My husband’s rolls generally turned out nicer-looking than mine, except, of course, when I went to take a picture. 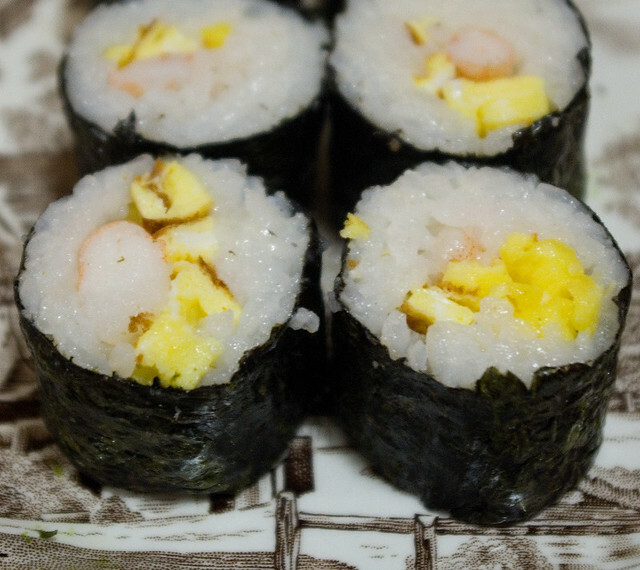 His egg, cucumber, and shrimp roll tasted pretty good, though. 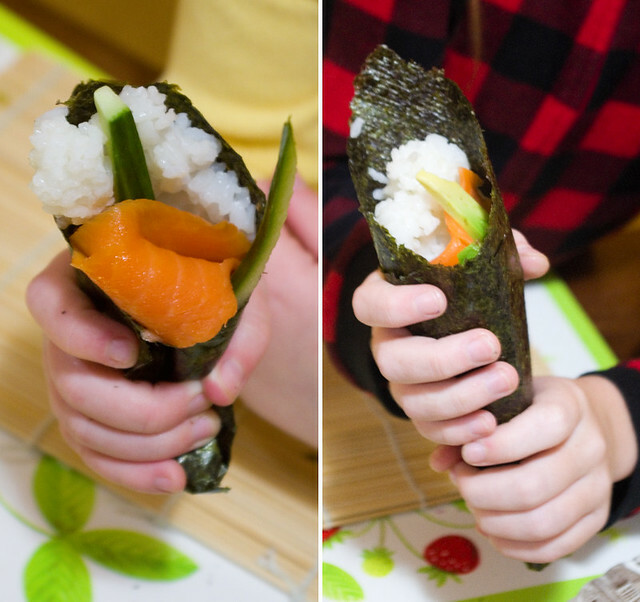 After a couple of messy (if tasty) attempts at maki sushi rolls, the girls tried their hands at hand rolls, which are the closest in assembly to a taco, which is where there experience lies. We had a really good time making and eating this dinner, and I’m starting to think I should have introduced homemade sushi long before now. I loved watching the kids’ faces light up when I told them that we could actually make sushi at home. 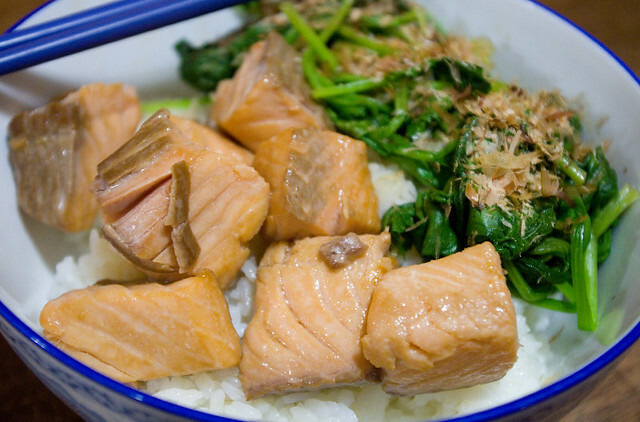 Not only that, but it’s a pretty healthy meal that’s infinitely customizable. We are definitely going to do this again, and soon. It needs to become a regular thing in my house again. It’s been unseasonably warm this fall, so I thought that another light, refreshing meal was in order. 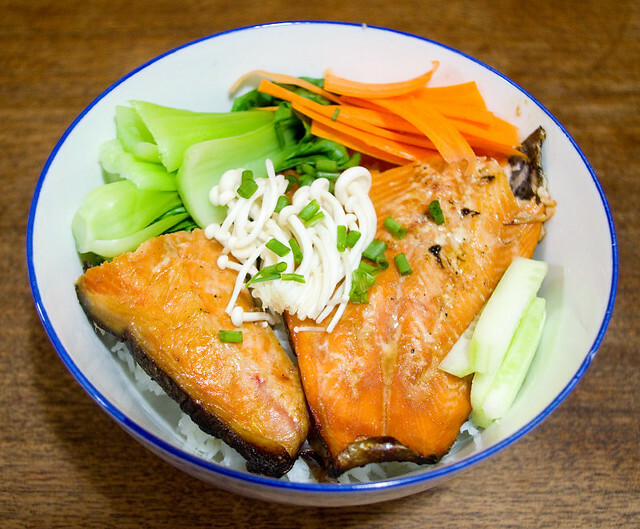 The girls requested rice bowls, so that’s what we ended up doing! I found a few pieces of both salmon and trout on special at the local grocery store, but neither one had quite enough to feed the entire family. In the end, I served each person a slice of each kind of fish. I marinated the fish in Kikkoman Teriyaki Marinade & Sauce, and then my husband put it on the smoker grill. I always cook this kind of fish on a baking sheet even on a grill, and even if it’s skin-on like ours normally is, because once done it tends to fall apart into the machinery beneath. While the meat was cooking, I put on the rice, steamed some bok choy, thinly sliced some carrots, cut up one of my many home-grown cucumbers, chopped the onion tops from my garden (they’re a great substitute for chives), and cut up some enoki mushrooms. By the time all that was done, the fish was ready. Then all that was left was to assemble the bowls, and to eat!